Lacrosse season is here and NEC Front Row will bring you a slew of games deep into the spring. We’re glad to hear that Keith was able to enjoy the recent Outer Bridge battle between Wagner and MAAC member Monmouth free of charge. Those who watched were treated to a four-overtime affair with the host Seahawks prevailing, 7-6. Watch the full event archive here. They both reached the 2,000-point mark on Monday. On Saturday, they meet face-to-face. Be sure to watch two all-time #NECWBB greats square off in the next-to-last regular season game of their careers. 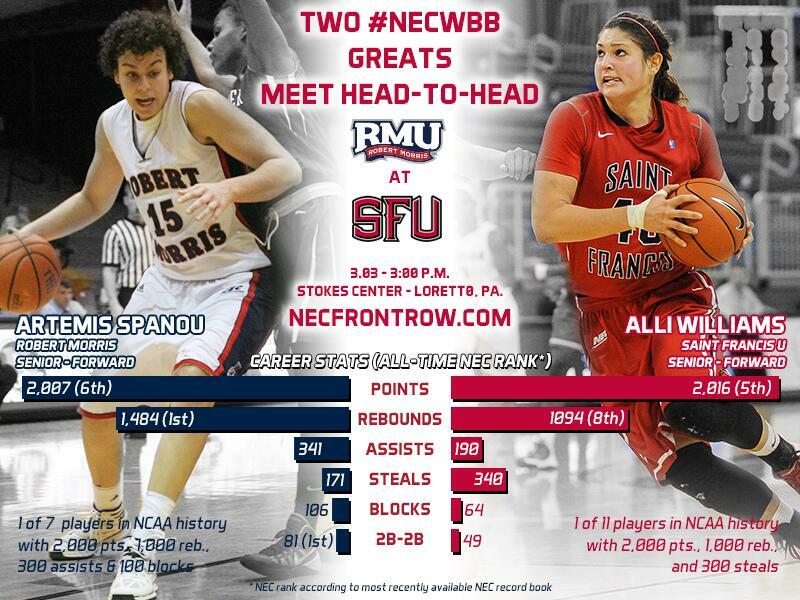 Artemis Spanou, the NEC’s all-time leading rebounder, leads first-place Robert Morris into a Keystone State Clash against Alli Williams and the Saint Francis Red Flash. NEC Front Row will air the game live at 3:00 pm on March 1. For Northeast Conference fans, March means more than just championship hoops. It means social media chatter, interactive fan contests and chances to win FREE STUFF from America’s most fan-friendly mid-major conference. Thanks to the NEC, the fans will once again be the key players this March. With so many people to follow and so much information to digest, it isn’t always easy to manage. Hence, the Overtime! Blog’s Twitter Take Five, a weekly feature that selects five of the most intriguing/significant Tweets from across the NEC and presents them to our fans right here on the Official Blog of the Northeast Conference. So, NEC Senior Associate Commissioner Ron Ratner just happened to be on Grymes Hill this past Monday night when history was made. With 12 points, 19 rebounds and a NEC single-game record 13 blocked shots, Wagner sophomore center Ugo Nwaigwe recorded the first triple-double in program history during a win over Fairleigh Dickinson. Freshman teammate Jasmine Nwajei nearly matched the feat in the same game, coming up one assist shy in what was the #NECWBB Game of the Week on ESPN3. If it happens over and over and over again, is it really news? A new edition of the National Tenpins Coaches Association Top 20 Poll is out, and, once again, all seven Northeast Conference bowling members are ranked amongst America’s Elite. There have been three polls of the NTCA membership this season, and all seven NEC teams were ranked in all three. Fairleigh Dickinson, which has resided in the NTCA Top 10 for its entire NEC tenure, owns the highest ranking of the NEC’s Super 7. The Knights jumped up one spot from their previous ranking and sit in the No. 3 position. Saint Francis U, which rose one place to No. 10, gives the Northeast Conference a second top-10 resident. Kutztown dropped two spots down to No. 11 in the nation, while Sacred Heart held steady at No. 12. St. Francis Brooklyn enjoyed the greatest surge of any NEC team this time around. The Terriers, who opened the season’s second half with 12 consecutive victories, jumped from No.17 up into the No.13 spot. Meanwhile, LIU Brooklyn also leapt four slots up to No.16. Adelphi, which had been as high as No. 11, finds itself hanging on at No. 20. All seven NEC teams will convene for the third, and final, conference meet of the regular season on March 1-2 in Mineola, NY. The top-6 teams in NEC regular season standings at the conclusion of the meet will advance into the NEC championship bracket. The NEC Championship will unfold on March 22-23 at Holiday Bowl in Altoona, PA.
After earning NTCA All-America honors as a sophomore, FDU anchor bowler Liat Vizenfeld has produced even more impressive results during her junior campaign. The six-time NEC Bowler of the Week was the featured guest during an early February edition of the NEC’s GEICO Google Hangout series.